You should take some time to understand the pros and cons of each structure before you dive in—this means learning more about what each type of corporation can do for you, both from an individual and a business standpoint. A C corporation, also known as a C corp, is a structure under which individual shareholders—that is, people who own shares of the company—own the business. Each of these shareholders is protected under a limited liability. This means that any liability or debt that the company should incur is not transferred to the shareholders. In a C corp, the shareholders do not necessarily make day-to-day business decisions. Rather, the company’s officers and executives make them, like the CEO, COO or CIO. Decisions about company policy and management fall to the board of directors. The shareholders elect this board, so technically, they will have the shareholders’ best interests at heart. A C corp is the standard form of incorporation. 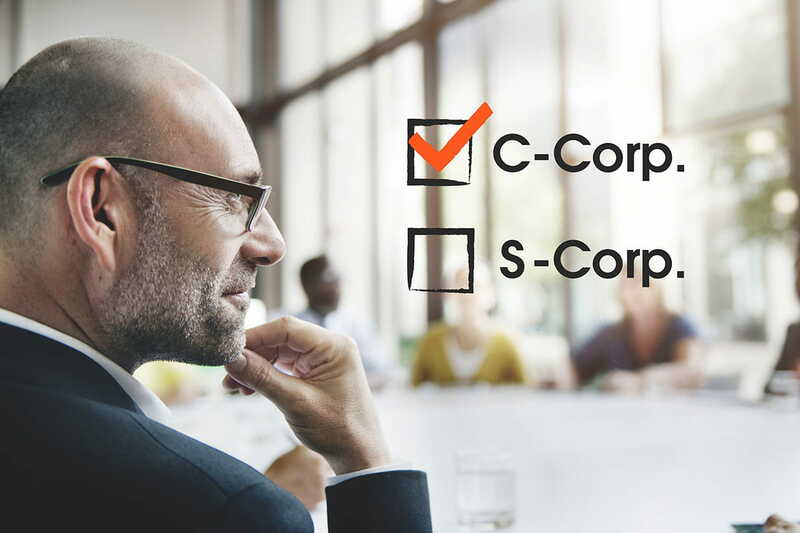 Unless you take specific measures to create an S corp, your corporation is classed as a C corp. To establish a C corp, you must file articles of incorporation with the state in which you are conducting your primary business. Once you have set up your C corp, you are bound by certain rules and regulations with regard to taxes, paying fees, issuing stock, proper documentation, compliance, and other financial issues. You will also have to appoint a board of directors, who must hold periodic meetings. Notes must be taken to establish that these meetings have taken place and this documentation must be made available if required. One of the main differences between an S corp and a C corp is that the latter is subject to double-taxation. This means that the business pays tax on the money it brings in—and the shareholders, in turn, pay income tax on the dividends or payments they receive. This is known as double-taxation. S corporations, on the other hand, have the benefit of pass-through taxation. This difference alone will arguably have the biggest impact on your profitability. More on that in a moment. The primary function of an S corp is to establish pass-through taxation. Simply put, this means that the onus of paying income tax falls to the company’s individual shareholders. Company profits and losses are not subject to taxation at the corporate level—rather, they are passed on to the shareholders, who are required to report them on their personal returns. Establishing an S corp is something you will do after you have already established your C corp. Once you have registered your C corp and paid all applicable fees, you must file form 2553 with the IRS, which is an intent to make an election to be an S corporation. This form must be filed no later than 75 days following the finalization of your C corp status. There are some companies that would benefit more from being an S corp than others. This is due to the various eligibility restrictions imposed upon S corporations. Citizenship: to establish or be a shareholder in an S corporation, you must be a citizen or legal resident alien of the United States. Foreign entities, partnerships, and other corporations are not allowed to be an S corp.
Company size: S corporations are limited to no more than 100 shareholders. If you expect your company to grow substantially beyond this number, S corp is probably not for you. Stock limitations: an S corp can only issue one type of stock. This may seriously impact your ability to raise capital and attract investment in your company. C corps are subject to double-taxation because the C corp itself is taxed at the entity level then at the shareholder level when it distributes dividends. On the other hand, S corps have pass-through tax benefits where the entity itself is not taxed, only at the shareholder level. Passed at the end of 2017, the Tax Cuts and Jobs Act [hyperlink: https://www.congress.gov/bill/115th-congress/house-bill/1/titles] provides a deduction for income from pass-through entities, such as S corps. Specifically, Section 199A was added to the Internal Revenue Code and enables pass-through entities to deduct up to 20% of qualified business income. The deduction is highly complex and requires a comprehensive review of prospective business activities by a tax or legal professional. But if the S corps income activities qualify for the deduction then it can lead to a significant reduction to the taxpayer’s tax obligation.Not only has the new Tax Reform impacted S corporations, but also C corporations as well. The tax table, among other revisions, for C corporations has been amended by reducing the maximum tax imposed to be 21 percent (21%) of taxable income. This leads to a significant tax reduction to C corps for 2018 compared to prior years. C corps are not subject to the same restrictions on ownership as S corps are. Any person, partnership, corporation, or entity can own a C corp. However, S corp ownership is limited to individual citizens of the United States or legal resident aliens. both types of corporation offer stock in the company to their shareholders, meaning that these shareholders essentially own the business. S corps, however, are limited to one type of stock. This means, in an S corp, that all shareholders are equal in terms of their rights in the business—they all share the same voting rights.C corps, on the other hand, can divide their voting rights according to the type of stock their shareholders hold. These types of stock can be common stock or preferred stock, but there are several ways that these shares can be structured. This allows for the assignation and multiplication of voting rights, allowing the company’s executives to maintain control over the board of directors when making any important decisions.In most circumstances, a C corps’ founding members will hold the most sway when it comes time to vote, meaning they hold the reins where most business decisions are concerned. Depending on your vision for where your company is going, a C corp may or may not be advantageous. The current administration has established a flat tax rate for C corps that caps at 21 percent—which is much lower than the previous rate of 35 percent. If your company is poised to scale, a C corp is probably the better choice as there are no limits as to how many shareholders you can have. Additionally, it is possible to attract foreign investment because there are no restrictions on who can own shares in the company. This may make it easier for you to raise money and it will also make your company more attractive when it comes time to sell. Liability is limited in a C corporation, meaning that shareholders, directors, employees—all stakeholders, actually—are protected in case the company falls into debt or is involved in a lawsuit. S corps and C corps share the advantage of perpetual existence. This means that even if the owner moves on or dies, the corporation will continue to exist in perpetuity. Double-taxation, as mentioned above, could be a concern in a C corp. The company is taxed at the corporate rate and, when dividends are disbursed, shareholders pay taxes on that income as well. In a C corp, losses cannot be written off by shareholders on their personal income tax returns. The process of incorporation is as involved as it is expensive. There are a lot of state and federal regulatory compliance issues to pay attention to and you must comply. The alternative is risk paying heavy fines and potentially losing your C corp status altogether. Let Filenow guide you, with our simplified incorporation process. From a bottom-line standpoint, there are many advantages to being a C corp. Though you may pay more in taxes initially, you will be able to take advantage of a lower tax rate; you will also be open to a great deal more, in terms of potential growth and investment. S corps, likewise, have their own pros and cons. Taxation is pass-through, meaning your company will not pay corporate taxes and is not subject to double-taxation. Shareholders in an S corp can deduct 20 percent of their business income on their personal income tax returns; they can also deduct business losses on their personal income tax returns. This could be a major advantage, during the first few years of doing business, as it is not uncommon for most startup companies to suffer through several months of loss before seeing any actual revenue. Liability in an s-corp, as in a c-corp, is limited. This means that shareholders, employees, officers, and directors are protected in the event that the company is involved in a lawsuit or is in debt. S-corps will also continue to exist in perpetuity, the same as a c-corp. Ownership is restricted to US citizens or legal residents. Corporations, partnerships, and foreign entities are not allowed to own stock in an S corp. This may limit your ability to seek investment over the long-term and it may impact your ability to do business outside of the United States. As an S corp, you may also be under more scrutiny, as far as the IRS is concerned. Miss a deadline, miss a payment, or fall short of your compliance obligations and you could be reduced to C corp status and take on the inherent tax burden that goes with it. If you are a very small business—for instance, if it is just yourself and one or two others—the regulations may be more than you want to deal with. Additionally, if you envision your company growing beyond 100 shareholders, being an S corp will limit your ability to do that. Bottom line, opting to be a C corp or an S corp has some significant plusses and minuses. In the end, it is about what is good for you, good for you company, and what is going to get you where you need to be. If you are getting ready to incorporate, reach out today. We are a business formation service dedicated to helping people just like you make sound decisions for the future of your business.